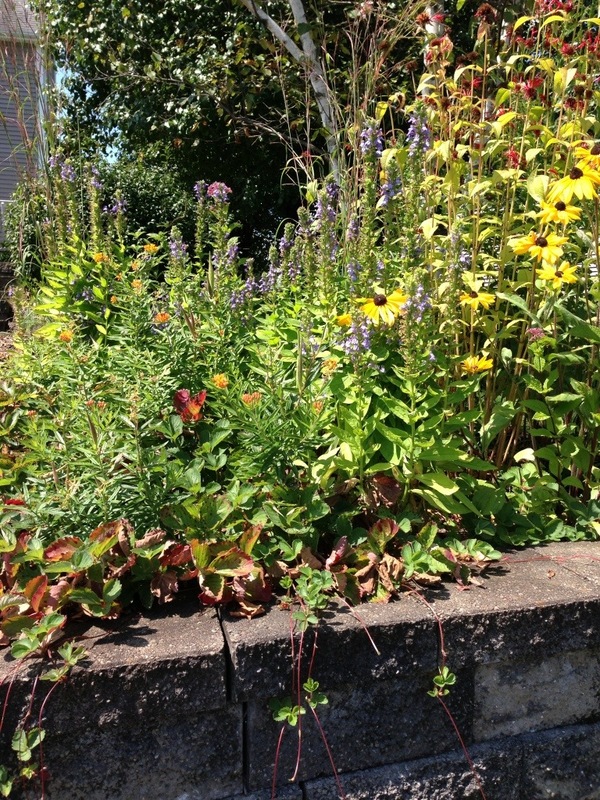 Edible plants can nicely augment eco-friendly gardens. 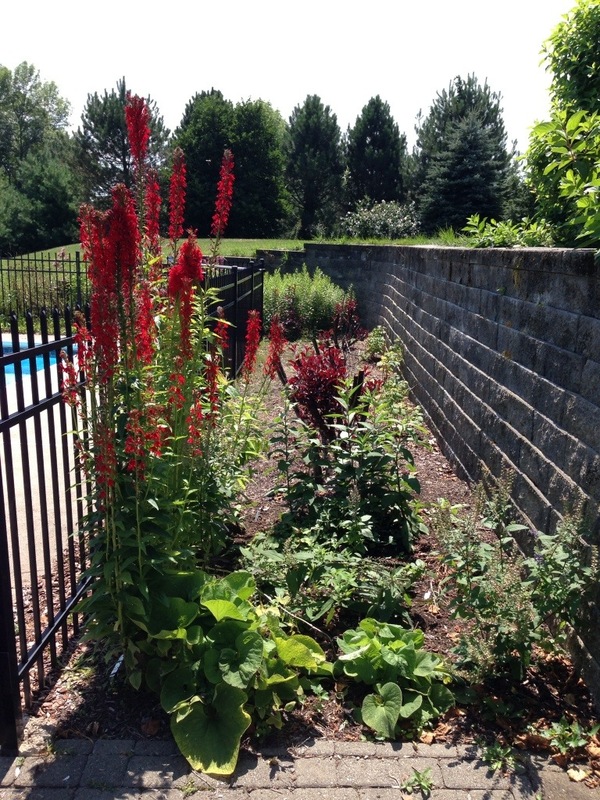 In Clifton Park, NY (which is located in southern Saratoga County), there’s an eco-friendly landscaped property that we’ve used edible gardens and edible plants and herbs generously in the design. The above photo contains a June-bearing Strawberry as groundcover along with Monarda didyma, Red Beebalm, which makes nice tea. The Lobelia cardinalis, Cardinal Flower is so happy in this spot, maybe because of all the rain we had this spring and early summer. There’s also Scutellaria incana, Scullcap in this section, a native plant and herb which has been used for it’s medicinal properties for centuries and on several continents. 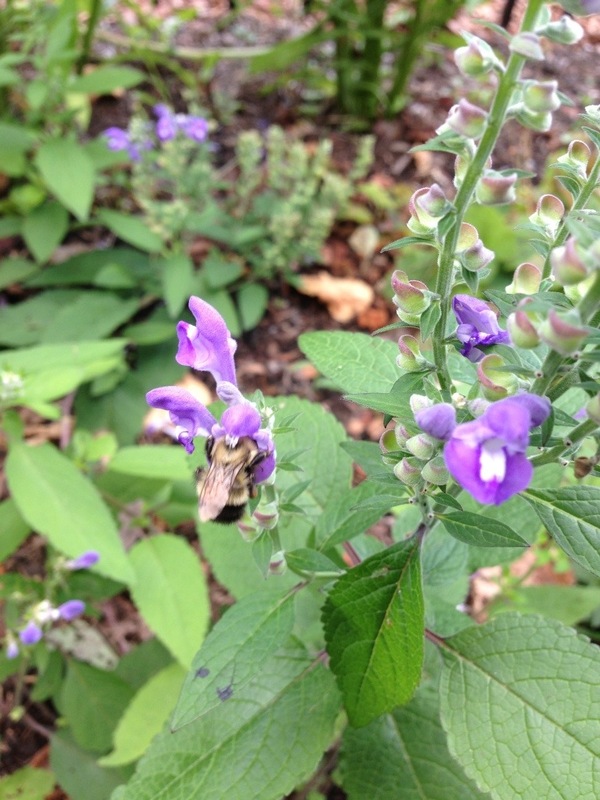 The bumblebees are big fans of Scullcap too. This bumblebee was so entranced by his pollen collection that he did not even notice me and I was able to follow him closely for several minutes. In this expanse of June-bearing Strawberries there is a young hardy Kiwi vine. We hope to have fruit by next summer. 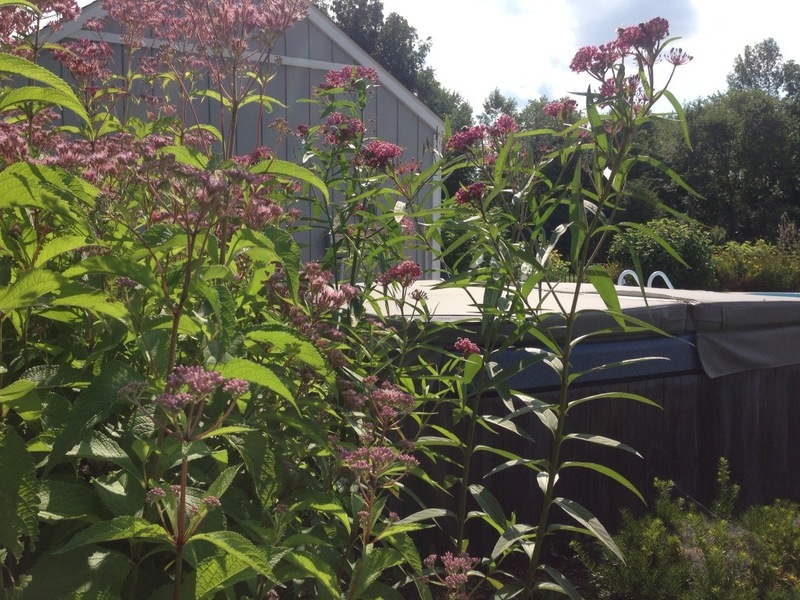 Adjacent to the hot tub there’s a butterfly garden: Asclepias incarnata, Pink Milkweed, which is the Monarch butterfly’s larval host plant and Eupatorium maculata, Joe Pye Weed. 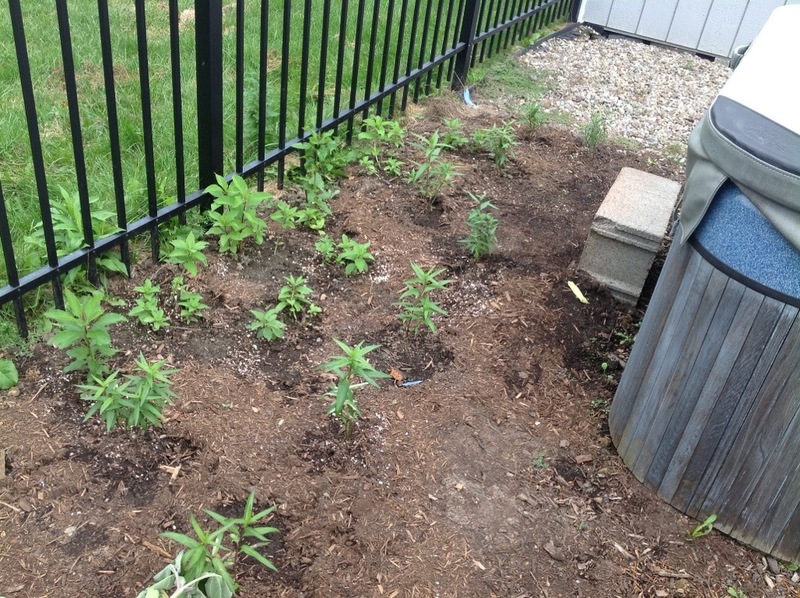 This is the hot tub garden one year ago, at planting time. 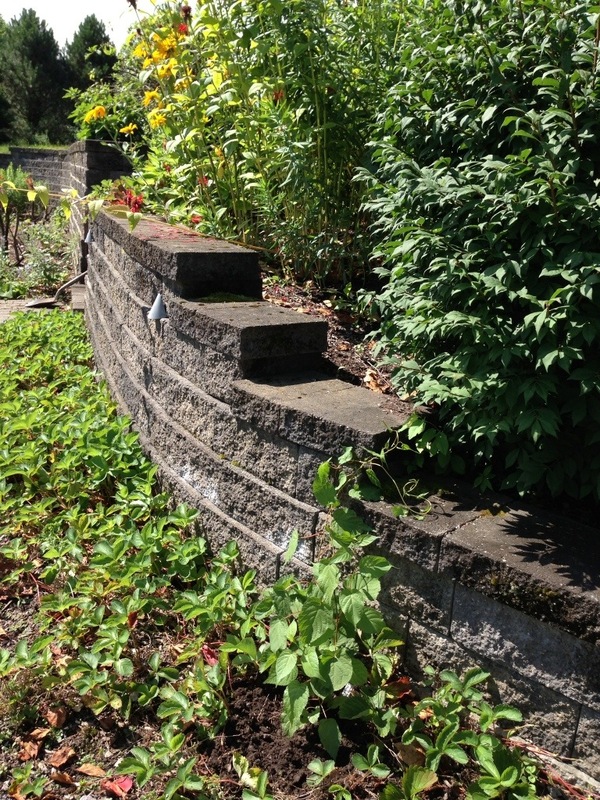 Landscaping with native plants can take patience; the first year the plants establish their roots and it’s not always until the second year that they really look like something. 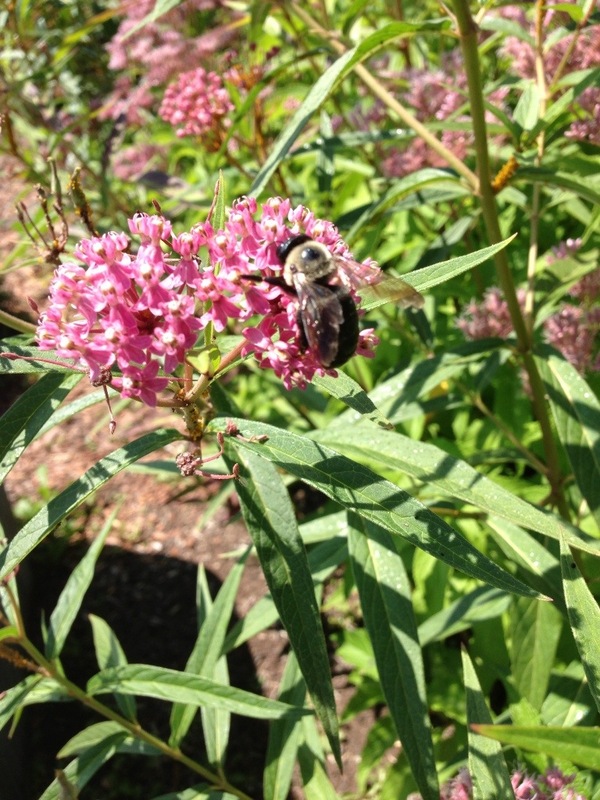 I’m not sure if it’s the same bumblebee on the Pink Milkweed, again letting me into his little world. 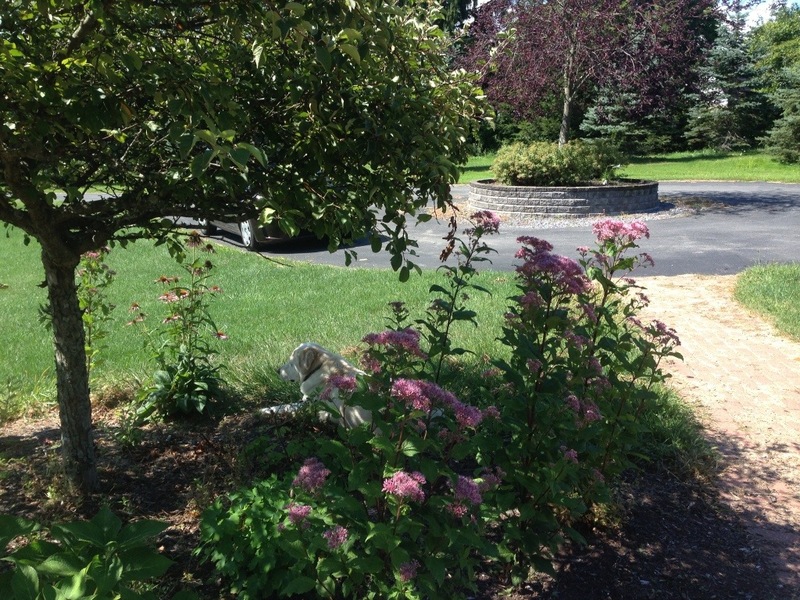 At the front of the house there’s a Crabapple tree with Eupatorium dubium, “Little Joe” Pye Weed and Aquilegia canadensis, Wild Columbine growing underneath. This southern Saratoga County property is astonishing on every visit. The land includes wetland and woodland habitats, and so the wildlife participation in the ecosystem has increased exponentially over the past two years: hummingbirds, butterflies, songbirds, dragonflies and native species bees are everywhere now that we’ve integrated edible gardens into the lovely eco-friendly landscaping in Clifton Park, NY.